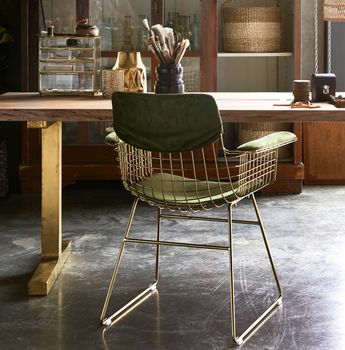 A truly lovely brass metal wire chair with arms. This is a super stylish chair which is created in a brass metal and features an eye-catching geometric shape.This is perfect for an occasional chair, dining chair or use outside. I would like a few in my garden for al-fresco dining (please note however this chair will not fair well if left out in the cold and wet, we suggest taking in during bad weather). These chairs do have cushions available.